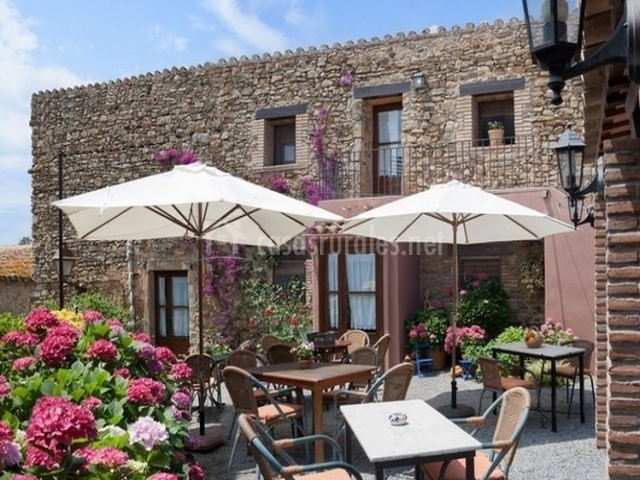 This house rural is located in the beautiful village of Peratallada , in the province of Gerona . A house that was restored in 1997 achieving full empastamiento with the style of architecture of the town to which it belongs. External stone and interior of wood , with warm colors, which manage to convey an atmosphere of relaxation and tranquility. A spacious kitchen fully equipped put at the disposal of all guests. Equipped with all kinds of appliances and utensils , it is perfect to prepare the best dishes without any problem. A dining room , located next to the kitchen, which has several tables so that all hosted customers have their site. Tables and wooden chairs arranged in a space characterized by the family atmosphere that is breathed. 7 complete bathrooms , located inside each of the rooms. With shower or bathtub and towels for the guests, the decoration is simple but in keeping with the rustic atmosphere of the house. 7 bedrooms , 5 of them double , room double call Altell, with a higher level and finally, a room triple . 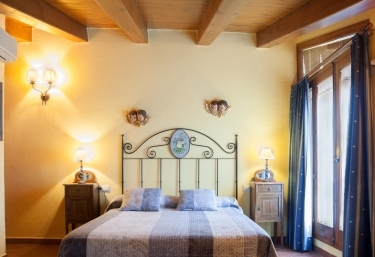 All double rooms have double bed and triple room, consists of three single beds . In addition, there is the possibility of adding a extra bed in each one. The breakfast is including in the price. Terrace with a porch , perfect to relax in the rays of the sun doing any kind of activity such as reading, eating or spending a relaxed afternoon chatting with friends. When it gets dark, the terrace has an extraordinary beauty thanks to all the elements that surround it and invite you to stay there all night long. Garden , located next to the terrace, composed of various flowers and decorative elements that allow guests to feel at home. 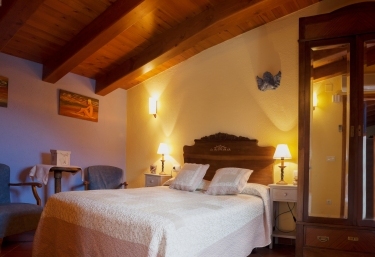 The rooms are made up of a double bed and a full bathroom. There is also the possibility of adding a extra bed. 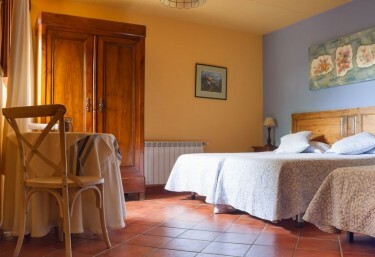 In addition, the rural house gives the option of converting each double room into one of individual use , in which case, the price to be paid would be lower. The rooms have a rustic setting and each of them is decorated differently but they all follow the same basic line: wood, beams and stone are the fundamental elements of the rooms. Each double room has television , wifi , hair dryer , air conditioning and heating available to guests. This space of the house, is perfectly equipped for enjoy a maximum of 2 people. Una double bed wide, with bed linen. It is an ideal space to enjoy the rest and tranquility, since it has all the comforts, and space for 2 people maximum. 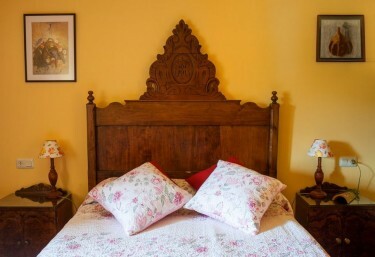 A double bed, with sheets and blankets, and a wooden headboard. 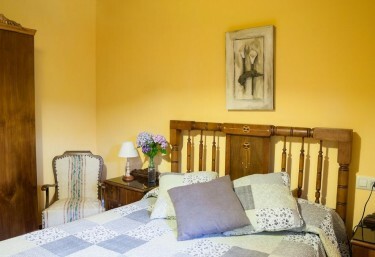 It is a bright and very pleasant bedroom, where you will be able to enjoy tranquility very much. La double bed , which is quite spacious. A bathroom completo, with the towel sets. 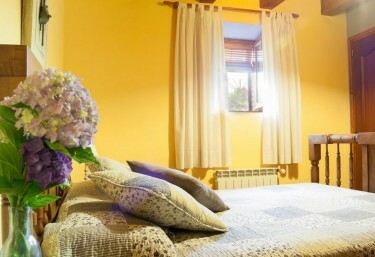 A double bedroom ample, in which are the sets of sheets and blankets. Un bathroom , with towel sets. The room consists of a double bed and a full bathroom in the interior of it. The country house gives the possibility to add, if necessary, an extra bed. The price of room includes breakfast. A large space that gives shelter to several elements that make the triple room a home. The wardrobe, made of wood, gives the possibility to store all the luggage without any problem of space. In addition, the room has a table and several chairs so that our guests can study, write, chat quietly as if they were at home. At your disposal also have a hair dryer, wifi, air conditioning and heating and n the room. The double room is, without a doubt, one of the most beautiful in the rural house. Its amplitude and its luminosity are the fundamental elements of it. With a c comfortable double bed and a full bathroom in the interior of the room, guests can enjoy at ease. In addition, the house gives the possibility of incorporating an extra bed to the room. The price of the room includes breakfast. A rustic decoration set in the history and architecture of the village, make the Iltell room a marvel. The views take you back to past times and a romantic air invades the space. The room has hair dryer, wifi, heating and air conditioning o available to guests. From Roman origin , the village of Peratallada is characterized by its medieval architecture . In fact, it is one of the most valued places in Catalonia due to the conservation of its monuments. The castle of Peratallada and the church of San Esteve son, without a doubt, the references to visit. A few kilometers away are the cities of Figueras and Gerona . The first is located on the border with France and is a mandatory stop for all tourists. For its part, Gerona is the capital of the province and the monuments that form it, such as The Cathedral, the Arab Baths or La rambla de la Libertad , allow tourists to travel to past eras. If time permits, the beach is a good resource to spend the day. Thanks to the location of Peratallada, in full Costa Brava , guests can choose between different beaches according to the tastes and disposability of each. The beach of Racó, the Cala de Illa Roja, the beach of Sa Riera or the beach of Fonda , located in different points of the coast, are accessible alternatives that will allow the clients to get an idea of ​​the quality and beauty that borders Gerona.